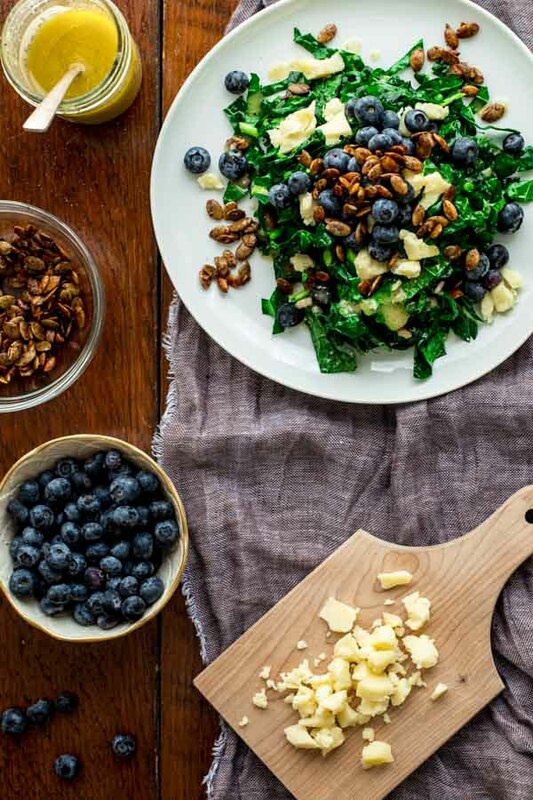 This Kale Salad with Blueberries, Manchego and Pumpkin Seed Clusters is just what the doctor ordered after the weekend. It is loaded with nutritious ingredients that will set you right back on course. 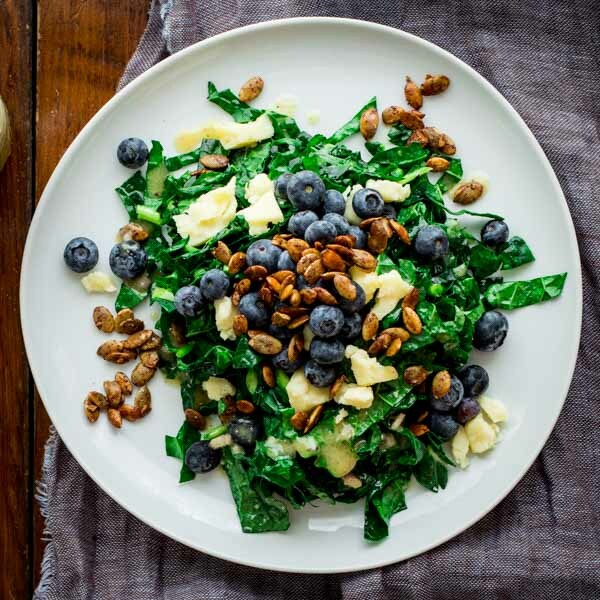 Blueberries and kale are both superfoods, so you won’t want to miss this combination! And not only are they both in season right now, but they are fantastic together. 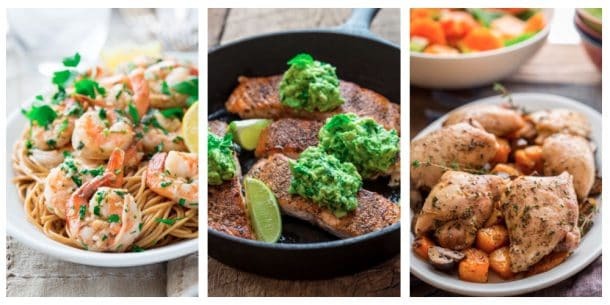 They are really the canvas for this recipe. Just toss the greens with the dressing. I used my favorite lemon juice salad dressing but if you like cider vinegar dressing or have another that you like feel free to mix it up. One of the great things about kale is that you can let it sit with dressing on it for quite a long time and it just gets better and better. So this recipe would actually be a great one to make in advance. 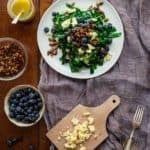 If you like a more tender result and want to eat right this minute, just gently massage the dressing into the kale a bit before topping with the blueberries, Manchego and pumpkin seed clusters. The sharp sheep’s milk cheese, now that’s the stuff! Manchego is probably the most commonly known one. Since I love Vermont cheeses, I used a Vermont Sheep and cows milk blend, Invierno by Vermont Shepherd. Either work great, or look for a locally made sheep’s cheese from your area. If you use the Manchego, just make sure to cut the waxy edge off. I crumbled the cheese instead of shredding it, and I love the way the cheese adds a big pop of flavor that really contrasts with the bitter greens and the sweet tart berries. Then there is the spicy and sweet pumpkin seed clusters, which are the perfect crunchy foil to add on top. They are a little sweet (and if you use the chipotle instead of the paprika- they are hot too.) Because it can be humid at this time of year, and honey is hygroscopic, the clusters can get tacky if they sit out too long. They are fine for an hour or so. I just mention that in case you’re planning to make this for guests and want to prep ahead. Add them on top just before serving. For more like this, check out this Ultimate Guide to Kale! 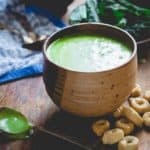 You’re going to love this easy Kale Cheddar Soup recipe. It is only 4 ingredients and ready in less than 30 minutes. And it’s super healthy because it is just broth, kale, potatoes and cheddar cheese! The texture is so velvety. It’s hard to believe that it is naturally gluten-free, and requires no sautéing, no making of roux, no fancy ingredients. Bring broth and potatoes to a boil in a large saucepan. Reduce heat to maintain a simmer, and cook until the potatoes are tender when pierced with a fork, 12 to 15 minutes. Add kale, and stir to wilt the kale. Cook, stirring occasionally, until the kale is bright green and just tender, about 5 minutes. Remove from the heat. Carefully puree in two batches in a blender or with an immersion blender. Preheat oven to 350 degrees. Generously coat a baking sheet with cooking spray or line with a silpat cooking mat. Stir pumpkin seeds, honey, cinnamon, chipotle and pinch salt in a medium bowl. Spread out onto the baking sheet. Bake until the mixture is sticky and fragrant, about 10 minutes, Stir with a spatula and return to the oven. Bake until the pumpkin seed clusters are dried out looking and clump together, 3 to 5 minutes more. Let cool before removing from the baking sheet. They will stick together as they cool to form clusters. Toss kale in a large salad bowl with the dressing. Massage gently if desired to tenderize the kale. Transfer to four shallow bowls. Top with blueberries and Manchego. Just before serving top with the pumpkin seed clusters and fresh pepper. I am surprised that you can find kale at this time of year. The salad looks super! I can’t even find the frozen one now…miss this power veggie. This salad looks absolutely delicious, I wish I had one for lunch! I have some fresh baby kale and blueberries that are beckoning to be turned into this salad. Now to get some manchego–love that cheese! This looks great Katie! It really adds a nice punch to the flavor of the other ingredients. Thank you Kristen. Thanks so much Catherine. And thank you for coming by today. So glad that you approve Melissa. Happy shopping! Love this salad! Totally my kind of summer meal. Yum! This looks so delicious! 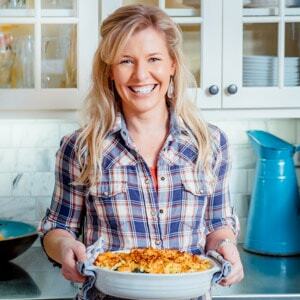 I am just getting into kale, blueberries are on sale and I love cheese! It is a winner for me! I recently posted Blackberry-Lemon Marmalade that you might love! Thanks Helen. Let me know if you try it! Hands down the BEST kale salad I’ve ever eaten…restaurant OR homemade!!! EVERYTHING about this works, from the dressing to the pepitas. Thank you for creating this!!! That is so nice of you to say! Thank you very much for coming back to leave a comment and review. I really appreciate that so much! This salad is delicious! Love the dressing and blueberries with the kale! My pumpkin seeds did burn a bit in the oven. Did anyone else have this issue or do I just need to bake these at a lower temp? Thanks! That’s great you liked the salad Joni. I have not heard that about the pumpkin seeds, but it sounds like maybe next time, err on checking them a little earlier than the specified range. Thanks for coming back to let us know that you loved it. I appreciate it so much!